What does Omer Aziz think about Abu Darda’s advice to Believers: “Let us smile to the face of some people while our hearts curse them”? Why is it that Muslim immigrants seek safety in Canada, or other Western countries — the very safety that they do not find in their own, Muslim, countries of origin? Muslim terrorists justify their attacks by reference to specific verses in the Qur’an, verses that cannot be changed. “White supremacy” terrorists, including the lone lunatic who shot up the two mosques in New Zealand, have no textual authority in the Bible to justify murdering anyone. 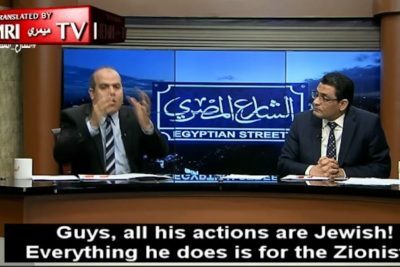 Here is the latest vivid example of Muslim Arab antisemitism. Antisemites in France, who unsurprisingly are so often defenders of Islam, if not Muslims themselves, have taken the “Gilets Jaunes” movement in a different direction from what it was at the beginning. This extraordinary remark ignores the texts of Islam itself. The stumbling Merkel administration, not knowing what to do about the superflux of Muslim migrants in its midst, has now decided to try bribery. Ocasio-Cortez should read up on the world’s failure to rescue Jews when it mattered most, and compare their fate, and the numbers of victims, with that of the Central Americans.